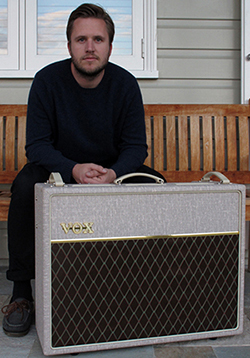 Killian Gavin is the guitarist in Australia’s Boy & Bear. When your first EP wins you accolades like Rolling Stone’s Artist To Watch of 2010 and Triple J’s Unearthed Artist of the Year, not to mention wooing fans the world over – including the likes of Laura Marling and Marcus Mumford, no less – there’s only one thing you can do for your debut album: confound expectations. After the phenomenal success of their 2009 EP, With Emperor Antarctica – which transformed the Sydney quintet from promising new comers to bonafide international sensations, helping them land two songs in Triple J's 2010 Hottest 100, including their critically acclaimed cover of Crowded House’s “Fall at Your Feet” – Boy & Bear found themselves perfectly placed to take things to the next level for their first full-length effort, the freshly minted Moonfire. That search for wisdom lead Boy & Bear to American producer Joe Chiccarelli, whose work with acts like My Morning Jacket, The Strokes and The Shins has earned him a reputation as someone who is both sympathetic to a band’s organic sound and able to add another dimension. Holing up with Chiccarelli in Nashville’s world-renowned Blackbird Studios in early 2011, Boy & Bear set about exploding their musical horizons. With first single “Feeding Line” – already a Triple J favourite – leading the way, Moonfire sees Boy & Bear shift effortlessly into darker, deeper moods, building huge atmospheres that owe as much to the intensity of bands like the National and Arcade Fire as they do to the sonic adventurousness of classic artists like Neil Young and Bob Dylan. Their honesty and hard work has indeed resonated with the public resulting in Sold Out shows across the nation for their first album tour, and a main stage slot at the Big Day Out. Moonfire now with 5 ARIA awards to its name and 3 songs in Triple J’s Hottest 100 this year. Natural, honest music that resonates with the listener ... when you put it like that, maybe not much has changed with Boy & Bear after all.